Kitchen workers, especially fry cooks may have a greater risk for injuries like burns and carbon monoxide poisoning. Though commercial fryers are relatively easy to use, injuries can and often do occur in the routine course of using them and especially in maintenance. 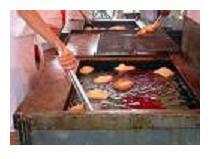 Consider that frying oil is generally kept at a temperature of about 350 degrees, anyone who works around them is at risk for injuries due to splashing oil. As to carbon monoxide poisoning, most commercial fryers come with a specialized vent for diverting the gas into a vent hood. However, when that vent hood is compromised or the exhaust is not properly maintained, the entire kitchen can very quickly fill with the gas. Protective measures are best. Restaurant managers need to be absolutely on top of their employees safety at all times. While it is true that it is the responsibility of the manager to provide a safe work environment, there are a number of things that employees themselves can be doing to ensure that they are safely handling the fryer systems. Management has to take care to make sure that there are nonslip pads on the floor near the fryer, that all employees handling the fryer are well trained and always cautious, that the vent hoods are regularly inspected and in working order, and that there is a class K fire extinguisher nearby in the event of an emergency. Inadequate or training that has not been taken seriously when using fryers is a big cause of injury amongst food service workers. Always take roughhousing and other hazardous behaviors very seriously and discipline accordingly to not only prevent injury, but insurance premium costs that can come of even minor injuries as a result. Here are a few tips for employees so that they can protect themselves from injury when working around the fryer. Always be sure to wear slip resistant shoes and the proper safety equipment. Pot holders and oven mitts should be used when lifting baskets and always wear steam gloves when changing or filtering the oil. Only add the oil to the fill line. An overfull fryer vat is an accident waiting to happen, as the oil can boil over very easily if it is too full. If you experience symptoms like dizziness, weakness or nausea, check with coworkers to find out if they are also experiencing them. If so, report this to the management immediately and be sure that the vent hood is in full working order. Never have drinks around the fryer- this can cause ice or liquid to go into the hot oil, which can cause splattering and splash overs that can cause injury. Always allow the oil plenty of time to cool before removal of vent filters and cleaning. Keep the floor around the fryer clean and dry at all times. An oily or slippery floor can lead to slips which will cause a burn. Never drop baskets abruptly into the oil. Always lower slowly, with care not to splash or move too quickly.